Would you like a little extra help setting wood fence posts? Look no further. Download the PDF or read through our step-by-step instructions right here. Set all wood fence posts with about 1/3 of their total length buried in the ground. This is especially important on corner posts and any posts that will carry heavy weight or withstand high wind pressure. Use a regular post hole digger to dig the post holes. Dig the holes straight to the proper depth at each stake marker. You can anchor the posts more firmly by making the holes slightly larger at the bottom than at the top. Place a large stone or two shovels full of gravel in the bottom of each hole. This provides drainage to avoid excessive moisture at the base of each post. Use a wood preservative to treat the section of the post that will be underground. Allow the post to stand overnight in the preservative so it can become well-saturated. You can pack the posts with either dirt or concrete. In either case, place two or three shovels full of gravel in the bottom of each hole before the post is placed into position. Be sure the posts are in an exact, upright position. You can check the alignment of each post with a regular level. You can also check the alignment of the posts in one direction by sighting from one end of the row of posts to the other. 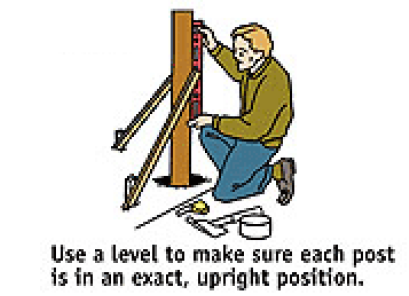 Brace each post with stakes after it is properly aligned. Keep the stakes in position until the concrete (if used) has thoroughly set. Remove the nails holding the braces and readjust the post until it is in accurate alignment. When the post is properly aligned, tamp it thoroughly to pack the dirt (if used) around the base of the post. Be sure you do not alter the alignment of the post during the tamping process. 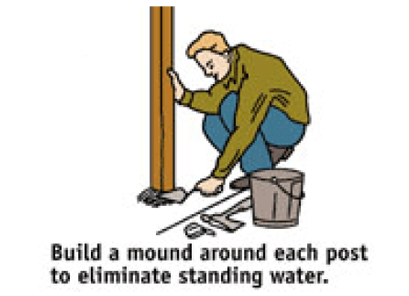 When the post is firmly in position, build a mound around it to help eliminate water standing at the post base. Slope the concrete slightly away from the post and round it off with a trowel. 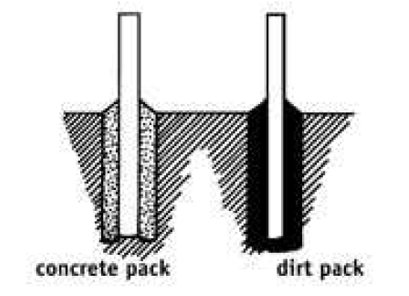 Tamp the concrete lightly to eliminate any air bubbles left in the mixture that can act as water pockets.